With some help from the folks on the pan-users mailing list, I was finally able to compile the code from a source repository being kept up by K.Haley, pan’s volunteer coder. But I thought it might be nice to provide a step-by-step guide for newer linux users, as the whole process of downloading source from a github repository, the tracking down of the necessary development libraries, and the entire compilation process can be daunting. Therefore, I came up with the following list of commands to run to get a patched version of Pan running from a normal install of Ubuntu 9.10 (Karmic Koala). And you’re done! You should now be able to use the Pan icon located in the “Internet” section of your main Ubuntu menus to run your newly-compiled application. ‘0 upgraded, 0 newly installed, 0 to remove and 166 not upgraded.’ which was not encouraging. The last few commands didn’t work after this. Thoughts? 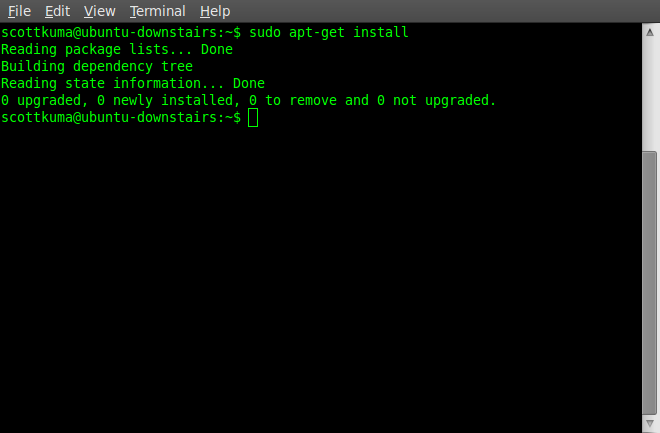 Hrm…that looks an AWFUL lot like a “apt-get install” response instead of a “make install” response. I have, out of pure muscle memory, made the same typo…. You might want to check what you typed. Now to see what I did and how it worked…. thank you a million times…worked great! ie: sudo mv /home/scottkuma/bin/pan . lol, i figured that much out, i didnt think you had a folder on my machine! Excellent – I miss compiling code. Worked like a charm. Thanks for resolving all the dependency issues for the rest of us! Tony – you’re exactly right, I did leave my username in there. That’s been fixed, and thanks for letting me know! All – Thanks for the great feedback! Based on some feedback from Olaf ‘Rhialto’ Seibert on the pan-users mailing list, I changed the references to your home directory in the code to the $HOME environment variable. This should be more portable, and require less changing around of the commands. Please let me know how it works! Thx a lot! Worked perfect even for newbie like me! Thanks a lot for making my Pan usage even more pleasant! Huge thanks from France ! My pan is working again (broken with gmime 2.4). I will propose your up-to-date version to Slackware developers. Very nice! I wish they would just update the program but this worked perfect. Works with Lucid Lynx 64-bit also ! Git and git-core have to be installed withe package gitk. OMG.. this worked so well! As Marcel says above, I got a couple of errors at the start, and was prompted to install git and gnome common separately, but after doing that, Pan ‘just works’. After entering sh ./autogen.sh –prefix=$HOME, I got the following error message: “You need to install gnome-common from the GNOME CVS.” Would appreciate any help on what to do next. This worked great. ubuntu 10.04 lucid lynx (64 bit). Thank you!! Thank you!! This has been a problem forever with Pan, finally fixed. I am showing errors after make. I think the autogen exited without errors. This is the end of the autogen ….. I just went through this process with Ubuntu 10.4, and aside from the git git-core to gitk change discussed above, I had NO issues. I’m not using studio, however, so I don’t have much of an answer for you. Mark H: If you could post what distro you’re using, and what kernel you have, it might make troubleshooting easier. This is a great work around for the multi-part PAN issue. I’ve now done this fix on an older Linux Mint distro, a Dell Studio running 10.10 Meerkat 64 bit, and now the latest, a triple boot mactel pro 8,2 running 10.10 32 bit using the same steps and all 3 have gone through without one error, no problems at all. Someone should bronze this article and keep it as long as PAN is still in the PPA’s.